Blast-off into an astronomical adventure where the whole family is set to see a glimpse of the galaxy. 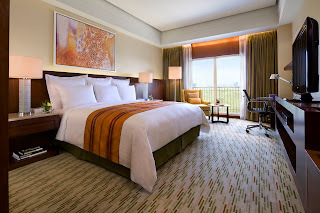 For the upcoming holiday break, why not whip up your own Marriott Manila experience with a bang and avail the Big Bang Stay package for only P10, 980 net. 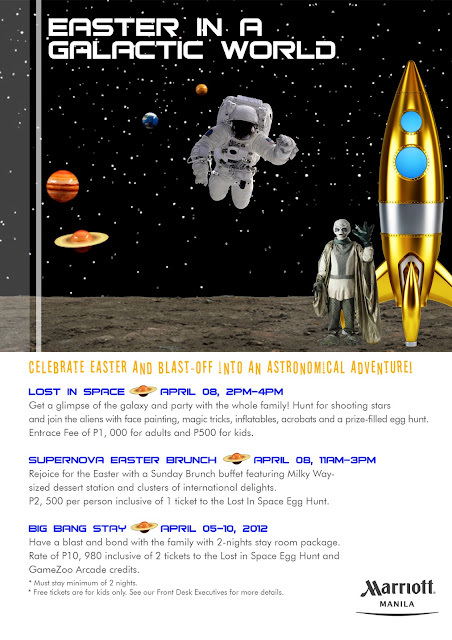 From April 1 to 10 for minimum stay of two nights, this offer includes two tickets to the Lost in Space Easter Party and Game Zoo credits at the Newport Mall. And on April 8, we greet the Easter Sunday celebration with two-hours of exploring the universe‘s most fantastic galactic goodies and activities. For only P500 (kid) and P1, 000 (adult) entrance fees, get to discover Marriott Manila’s phenomenal Easter party which has been packed and full for two years straight. Hunt for shooting stars and join the aliens for an afternoon of face painting, magic tricks, and games. Plus, there are also inflatables, acrobats and the most-awaited egg hunt that all kids are surely looking forward to. Aside from these, we pump up the thrill with an exciting line up of lip smacking snack sampling from Kroketten, the crunchy and healthy Danish potato balls with Pinoy twist. Aside from this, Jack and Jill are also giving away their most-loved products from chips to cookies! If the games and activities will make you feel dry, Fruit Magic has a thirst-quenching booth of fresh fruit juices. Plus it doesn’t end there. If you fancy heavy and filling afternoon snacks and finger food, the buffet station offers sensual varieties the whole family will surely drool over. To enliven the galactic vibe, Enchanted Kingdom’s Eldar and Princess with Chips Delight’s Smiley and Bugsy are ready with their dance numbers to make the little ones extra perky and entertained, all participants will take home a gift loot packed with candies and snacks courtesy of Oishi, Jack and Jill products, Chips Delight, Yakult, Dranix, souvenir memo pad, star pen, pencil, and ID lace from Enchanted Kingdom. Baicapture will also keep the memories alive with their photo booth ready to take captured moment as a souvenir of the event. For a more private Easter celebration, head to Marriott Café where an elaborate brunch buffet spread awaits at P2, 000 per head, with inclusive two Lost in Space Easter party tickets. Explore the fourteen mouthwatering stations with more delightful gourmet additions from Cru Steakhouse, huge chocolate room, and martini section. With this and more, Marriott Manila is simply the perfect venue to revel on the Easter. this looks nice! I wish I could bring my tot for this easter celebration.